Thanks to Werther’s Original® for sponsoring this recipe post! I even love all the little logistical details that come along with goals. I love tracking progress, measuring my advances in various ways, keeping track of data, adjusting my efforts based on data. Oh man. I just get this nerdy thrill out of it. It’s the same nerdy thrill I get in an office supply store. You guys get that, right? Tell me you get that, please. I don’t think there’s anything wrong with that. I think it’s part of what makes me an effective teacher and part of what helps me grow as a person. I also think the resolutions and goals we set for ourselves can become a distraction — a way of procrastinating on the real, hard, nebulous work we need to do. Goals are fun because we can tell ourselves to eat fewer sweets when we really need to find a way to love ourselves, to change our whole outlook and lifestyle. We can tell ourselves to read a certain number of Bible chapters a day when we really need to make time to commune with God again — that quiet space where we sit with Him in humility and openness. We can tell ourselves to spend less money when we really need to examine our priorities, look at our possessions with new eyes, and change how we value things. Don’t get me wrong. Eat fewer sweets (uh, start after this mug cake, though. Trust me.) Read the Bible. Spend less money. Those are all great goals if they’re right for you. But also value yourself enough to be vulnerable to big, real changes in your perspective. What’s been knocking on the door to your heart or conscience lately? Let it in and listen. 1. Practice mindfulness: sit with feelings for longer, observing them and seeking to understand them fully before reacting to them. To accomplish this, I can picture myself going outside more each day, observing my surroundings more than I do now, talking less than I do now. I imagine more baths, more music, and more time spent throwing my dog’s rubber squeaky toy. Just being where I am. 2. Start living a more humane life. I want to think about the food and other items I buy and how they affect the environment. I especially care that the food I’ve purchased for so long has caused undue suffering to animals. While avoiding any perfectionism or obsession, I want to make better choices, buying meat and produce from places I trust. It might hit me in the pocketbook, but I’ll pay more to know I haven’t participated in unethical practices. 3. Listen with a totally open heart to God. This means being willing to abandon doctrine I’ve grown up with my entire life if it conflicts with what I know about freedom in — and willing service to — Christ. This is something that’s been in the works in my heart for years, and indeed, this past year I feel like I’ve made great strides. Christ didn’t die so I’d follow a set of rules and it hurts real people — real souls — if we as a Church keep pretending like He did. I’m sure I’ll write more on this in coming posts. It’s weighing on my mind. I can’t decide if those goals are distractions or if they’re the real life work I need to do this coming year, but either way, they’re a good start for me. I’m hoping for more discernment as the year unfolds. I also want to break down this year’s goals (whatever I end up settling on!) into a few things I can do monthly (I got this idea from the unsteady), so I can keep track of my progress and make sure my goals are meaningful. Oh, is my nerd showing again? Lemme just tuck that back in and move on to the cake! OH BOY, what a cake! Imagine you’re home in your jammies and a dessert craving hits. You could just have a bowl of vanilla ice cream. You could have a handful of chocolate chips. 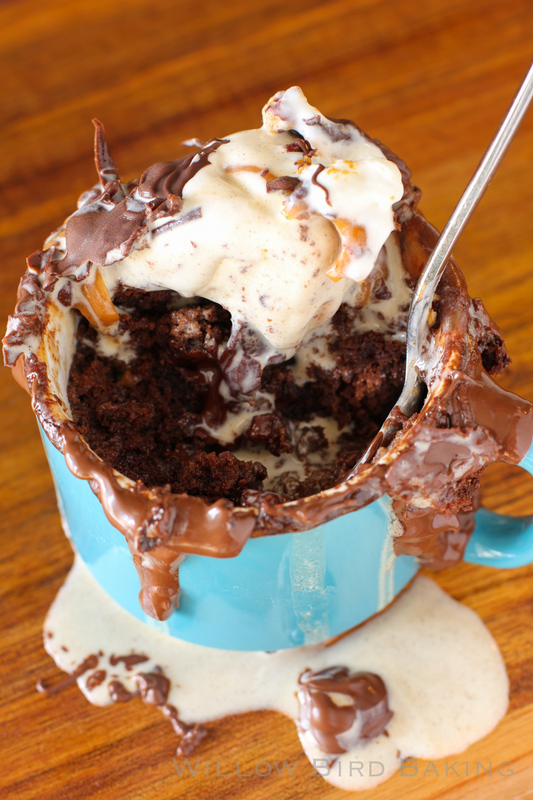 OR YOU COULD GATHER UP A FEW THINGS FROM YOUR PANTRY AND HAVE THIS CHOCOLATE MONSTROSITY. I made this one for Mike in just a few minutes, snapped some photos (which involved Mike drizzling chocolate while I said, “More. More. A little more. Still more.”), and bam! he was digging in to a decadent dessert à la mode. What are you considering for your New Year’s resolution? I took an already-great mug cake from one of my faves, America’s Test Kitchen, and pumped it up! I added some espresso to deepen the chocolate flavor and a slew of my favorite toppings from my pantry to create a dessert as decadent as one it takes hours to make. Throw this together at home when you want a special dessert but don’t want to get out of your jammies! 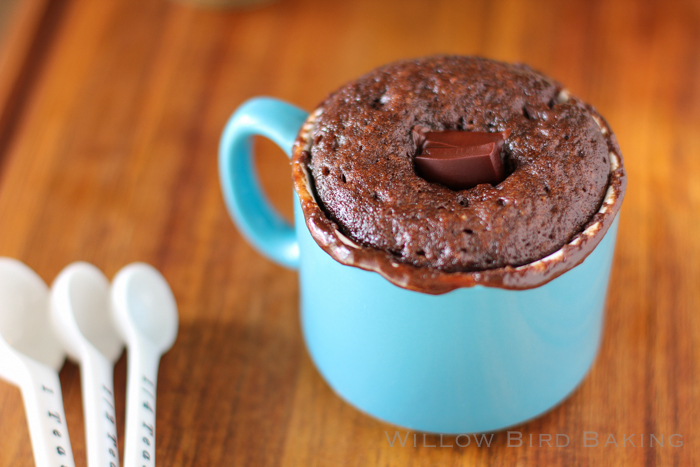 I used a big espresso mug for this cake, but you can use any regular size coffee mug that’s microwave safe. Different microwaves may require different cooking times, but your finished cake should look set up but very moist. Place butter and chocolate chips in a coffee mug and heat on half power for 15 second intervals, stirring between each interval, until melted (about 45 seconds total). In a separate small bowl or ramekin, whisk together the flour, baking powder, and salt. In a separate small bowl or ramekin, whisk together the egg, vanilla extract, and espresso powder. When the chocolate is melted in your mug, stir in sugar and cocoa powder. Stir in the egg mixture. Stir in the flour mixture. Stir well to eliminate lumps. Microwave the mug on half power for 30 seconds (I set mine on a plate just in case there’s spillover). Stir. Microwave on half power for 35 seconds (the cake will rise over the top of your mug like a giant soufflé, but stay calm.) Press the square of chocolate bar down into the center of the cake (I broke mine into two pieces), being careful not to burn your fingers. Microwave on half power for 40 seconds. Let the cake cool in the mug for 2 minutes while you prepare your toppings. Melt the chocolate chips by heating on half power for 20 second intervals, stirring between each, until melty. Melt the Werther’s Original® Baking Caramels by placing them in a small bowl with the milk. Heat on 30 second intervals, stirring carefully between each, until melty. 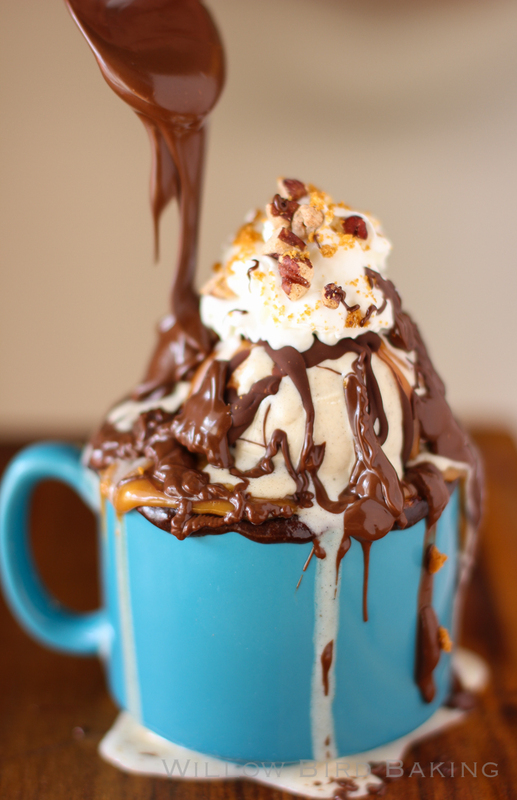 Top your mug cake with a big scoop of vanilla bean ice cream, caramel sauce, chocolate sauce, whipped cream, crushed toasted pecans, a crushed cookie (I used a Biscoff cookie), and the kitchen sink. Just kidding about the sink. Enjoy! 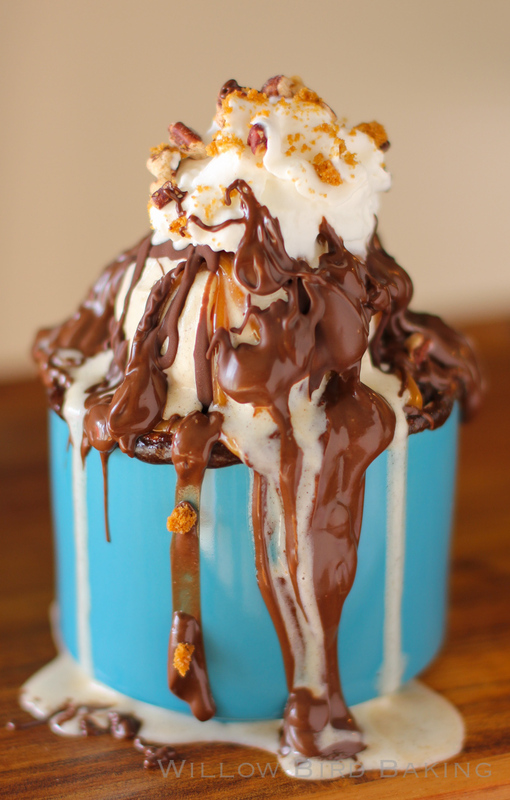 This mug cake sundae looks incredible! what a treat! Your resolutions sound brilliant, I really should try to be more mindful, it’s so easy to let the simple experiences of life slip through your fingers. Goodness gracious, this looks fabulous! I’m saving this recipe for whenever my next intense chocolate craving hits! Which will probably happen today. 🙂 Happy New Year, Julie! I resolve to eat more chocolatey goodness like this, as if there wasn’t already enough of it in my diet! haha Happy New Year! Yes please, right NOW please!!! Hi Julie! Everyone is eagerly waiting for me to make this brownie sundae for the family! Didn’t realize that all I needed was a brownie to get their attention! 😉 I was wondering though, which church you were talking about regarding the “conflicting doctrine” in which you grew up. It was an interesting entry for me to read. Thanks. Hi Toni! Hope you love it! I grew up in (and am still part of) a typical American Protestant church. Pinned to my Dessert board to try soon! 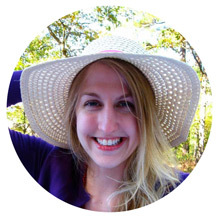 So interesting that you talked about mindfulness – because that’s on my resolution list as well. I really resonate with the whole way you were talking about goals and resolutions. Sometimes it’s better (and more effective) to get to the root of it all. It’s great to make small strides and changes, and those can add up – but sometimes it is real deep work that we must do first (or also). Setting goals are real fun and challenging too. 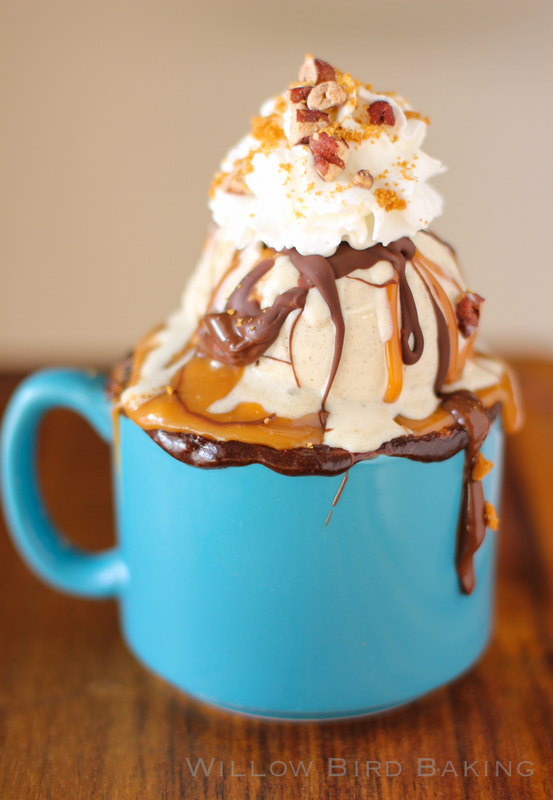 Now i got one goal to look forward to over the weekend;make my own “Ultimate Gooey Caramel Brownie Mug Cake Sundae”. Made this slightly modified due to lack of required ingredients. I didn’t have instant espresso powder, but I did have very dark brewed coffee…so I added a splash of that. I also didn’t have caramel or cookies. So I made a chocolate/peanut butter/coconut topping with some coconut oil, natural pnut butter & chocolate chips…& topped that with coconut flakes – it was heavenly (or IS..I couldn’t wait to comment, digging in as we speak!!) Though, I’ll be investing in some caramel & instant espresso & biscoff cookies for next time around!!! I loved your article. I clicked on this for the desert but I wasn’t expecting a lovely piece of mind to go with it. I just agree with you on so many points. Jesus really did come so that we could have life , and have it in abundance until it overflows. I hope you continue cooking, checking off lists, and loving life. Where can you buy the Caramels from ? Hi Emma, I get mine at my grocery store in the baking aisle. I think Werther’s website also has a link where you can locate a store that sells them. I just read your resolutions….I totally agree with #3. Jesus sacrificed himself so we don’t HAVE TO do any thing…whether it is adhere to a set of rules and regulations from a “religious” group to be accepted by that group or a mindset or behavior that has enslaved us. Wow! that is one amazing cake! Can we use whole wheat flour and instead of egg can we use curd, pls advice. One egg per mug is too much for me, I hate the eggy smell – do you think I can reduce it to half an egg by doubling the other ingredients and making two mugs? I haven’t tried it, Kavita, but it sounds like it’d work fine. hi Julie! I was just wondering if you think I could make a big batch of this dough. My husband is always asking for this mug cake and I thought I could prepare more at a time and add the rest after… What do you think? This mug cake is now our home favorite. I sometimes vary what I’ll stick in the middle of the batter: caramels, raspberry jam, Nutella, peanut butter. It is delicious! 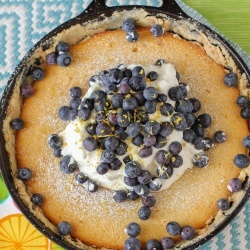 Thank-you for sharing this recipe! the salt in this cake is too much my mouth is sad. i drowned the cake in ice cream so i wouldn’t have to taste it. how can something so beautiful taste so bad. i wish i could go back in time and change my mind to not make this cake. i need water. There’s only 1/8 teaspoon salt in the cake; it shouldn’t be detectible. Are you sure you didn’t use salted butter? Cant wait to try making this! It looks amazing!!! !